A native mobile app you can use to connect to your Jira account on the go. Jira Cloud or Jira Server version 7 and above are supported with support for Jira Software features (previously called Jira Agile). You may be wondering why you should use our app, or pay for the add-on to unlock premium features. If you are a Cloud user you may also be asking how Jira in Motion is different to Atlassian's mobile app. We'll tell you! Jira in Motion has been designed from the ground up to help you be as productive as possible whilst on the move. 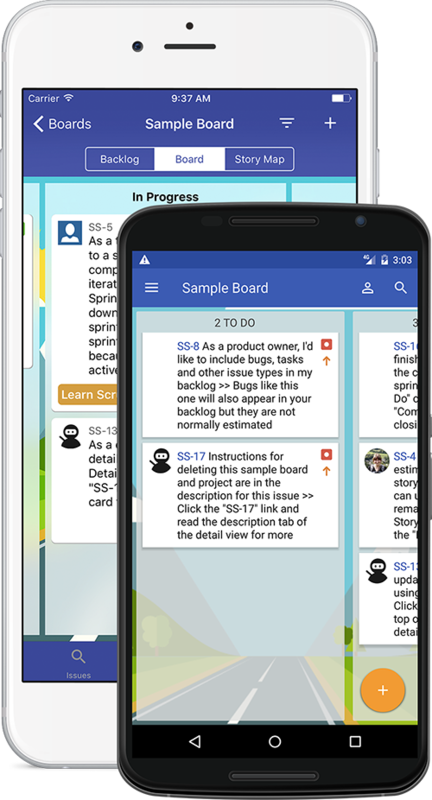 Our user testing shows that users get things done faster and stay more engaged when using Jira in Motion on their mobile devices. Who knows, with our beautiful user interface you may even have fun whilst working! View your product in a whole new light with features such as Story Maps. A Story Map helps you keep your eye on the goal and gives a holistic view of what your team is trying to achieve. This is just one of the many features available to users with the Jira in Motion add-on installed.